PUPPIES AT SPRINGLAKE ARE BRED WITH THE UTMOST CARE AND LOVE. MY PUPPIES ARE BRED TO BE HEALTHY HAPPY PETS FOR YEARS TO COME. THEY HAVE THEIR PROPER IMMUNIZATIONS BEFORE ELIGIBLE FOR SALE AND ARE DE-WORMED. I NEVER SELL ANY OF MY PUPPIES UNTIL THEY ARE AT LEAST 12 WEEKS OLD. THE SMALLER THEY ARE THE LONGER I KEEP THEM. I DO PRODUCE SOME VERY SMALL PUPPIES ON OCCASION AND THOSE I KEEP UNTIL I FEEL THEY ARE READY TO GO TO THEIR NEW HOMES. MY PUPPIES ARE SOLD ON LIMITED AKC REGISTRATION UNLESS OTHER ARRANGEMENTS HAVE BEEN AGREED UPON. 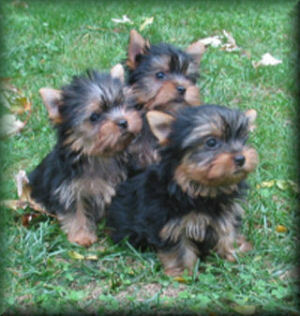 IF YOU THINK YOU MIGHT BE INTERESTED IN A SPRINGLAKE YORKIE CALL OR E-MAIL ME AND SEE IF I HAVE WHAT YOU ARE LOOKING FOR. Copyright © 1980-2019 All contents are the property of Springlake Yorkies or have been used with permission of owner and may not be copied or reproduced without expressed written consent. All rights reserved.